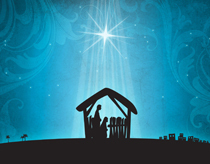 Celebrate the true reason for the season with our Children’s Christmas Play! Afterward, join us for a delicious (and free) Christmas dinner complete with all the fixings. When you’re done feasting, children age 10 and under are invited to take part in our annual Toy Giveaway and bring home a special gift as we remember the best present of all – Jesus! Toys are available on a first come, first serve basis; children participating in the Christmas play will be able to choose their toys first.